MMA content on my website has been few and far between as of late. I still follow the sport on a regular basis. Still, it’s become difficult to get excited about the fights due to an oversaturation of events that carry a decreasing amount of divisional relevance. This Saturday will serve as a different story as UFC 211 presents a stellar main card. Two title fights, a welterweight bout that will solidify a #1 contender along with two great pairings will round out what could be the best show in years. This is a rematch from their 2014 clash wherein a losing effort, Miocic became a made man through skill and will. 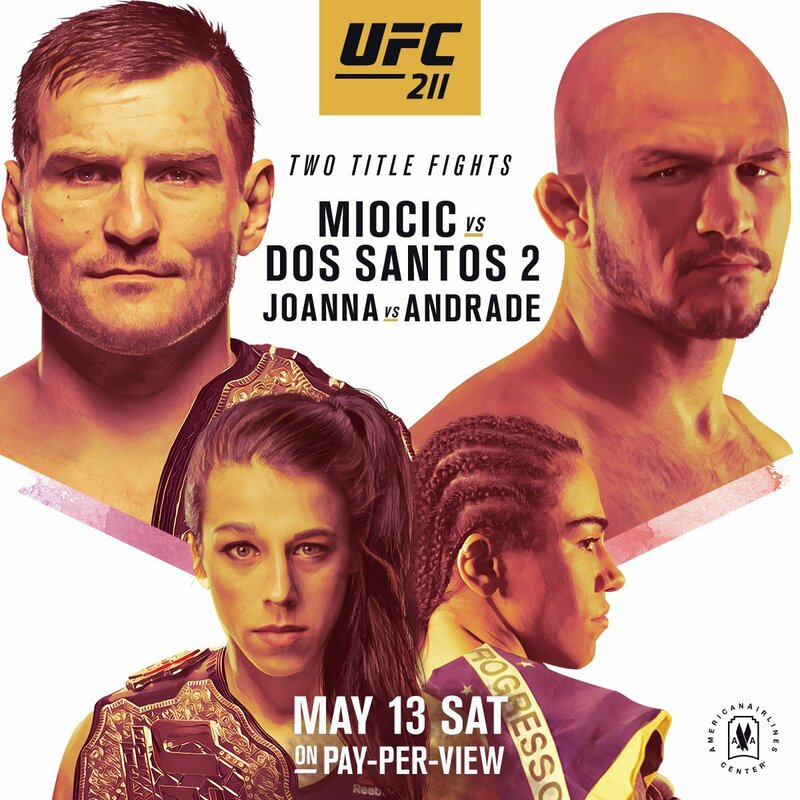 Fast forward to today, Miocic is the champion who is hitting his peak while Dos Santos has just about passed his. Both men primarily use their boxing skills in the cage while Miocic’s wrestling gives him the advantage on the ground. Dos Santos hits harder but when he gets in trouble he often throws the same one-two and keeps his hands low while backing up against the cage. He does this so often that I’ve found myself screaming at the TV for him to change it up. Miocic is on a roll. He’s more athletic, has power in his hands and is more diverse with his punches, which will serve him well. Joanna Jedrzejczyk is the face that runs the place when it comes to the strawweight division. Her high volume of strikes land with pinpoint accuracy. Jedrzejczyk is also difficult to take down and it’s even harder to keep her on the ground. Jessica Andrade likes to throw big looping punches and possesses a strength advantage. Andrade will give the champion a tough fight, but in the end, Jedrzejczyk won’t encounter anything that she hasn’t seen before. Many have questioned why Maia took a fight with someone not named Tryon Woodley when he’s already the #1 contender at welterweight. Some fighters in Maia’s position have no problem waiting while others like to stay busy. Maia is the best BJJ artist in the game so there is no surprise as to what his game plan will be. Masvidal is tough as nails, has decent striking and is harder to take down than most. In the end, Maia will use superior grappling technique along with his improved striking to score a second round submission. There is a lot of hype on Yair Rodriguez after his swift destruction of BJ Penn. Penn is a shell of the fighter he once was and Frankie Edgar is the answer that keeps on giving. Rodriguez has good technique on the feet and will bring the fight, however, I don’t see Edgar losing to anyone in the featherweight class not named Aldo. Jotko is riding a five-fight winning streak in the talent-rich middleweight division. Branch returns to the UFC with ten consecutive wins in the World Series of Fighting where he held their middleweight and light heavyweight titles simultaneously. Branch is bigger, stronger and does his best work in the clinch and in top position. Jotko is a southpaw who strikes from a distance and lands counter shots. While Jotko is better at mixing it up, this will be Branch’s first three round fight in a while, which will allow him to be more aggressive and grind out a decision. ‹ Billy Corgan Buys the NWA; Now What?